Woah…sounds like YGD’s philosophy, if we do say so ourselves. We also celebrate individuality (did you see our “Who Wore it Better” blog?! ), give clients the freedom to customize our designs and of course, light cities (literally!) across the world and create buzz within a space. 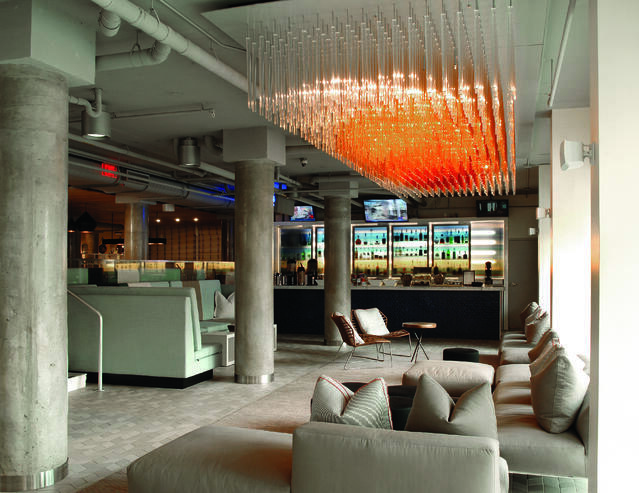 Therefore, it comes as no surprise that Yellow Goat Design collaborated with Add, Inc. (aka Stantec) and the Aloft to design a hip, signature fixture at the newly opened South Beach, Miami location. Located in the “w xyz” bar, our showstopper takes front and center while guests mix and mingle underneath. This warm and vibrant sculpture features 1026 custom colored 18mm acrylic rods, strategically placed, to create an effect that mirrors the infamous Miami sunsets. Each acrylic rod, also individually hung on solid ¾” satin finished rods, is suspended from a central ceiling plate painted to the match the ceiling… talk about dedication! The fixture is lit by approximately 150 LED bi-pins that are fully integrated into a solid state LED system. The LEDs are dimmable so the Aloft can adjust the lighting levels based on time of day and happening events. The result: a fixture that adds sizzle while guests sip on sunset cocktails. Creating a feeling and experience is the name of game when it comes to hotel design. Investing in art through lighting and design will leave your guests with great memories and keep them coming back for more. Call us… we are always up for the challenge!